Cultures from all over the world united at the Seagate Convention Centre to promote ethnicity. The Toledo Sister Cities Ninth International Festival was held on April 14 from 11 a.m. – 8 p.m. Program booklets were available upon entry into the festival that detailed Toledo’s 10 sister cities in Spain, China, Hungary, Poland, Japan, Tanzania, Germany, Lebanon, Pakistan and India. During his welcoming speech to the crowd, James H. Hartung, president of Toledo Sister Cities International, said that 2018 represents the 25th anniversary of the organization. Sara Clark, interim director of the Center for International Studies and Programs at UT, also spoke to the crowd and said that UT is home to over 2,000 international students from over 90 different countries. “The University of Toledo is so pleased to have a continued and growing partnership with Toledo Sister Cities, so thank you, Toledo Sister Cities, for including the university and allowing us be part of your continued growth,” Clark said. 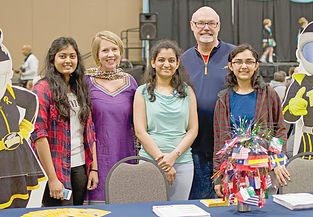 Clark added that UT students taught foreign languages to groups of participants at the festival’s Language Corner. Olivia McAdams, UT graduate transfer student from the University of Albany, studying Japanese, said that she volunteered at the Language Corner after a flyer advertising the festival peaked her interest. Vendors sold authentic ethnic foods, crafts, clothing and other goods while groups held performances onstage. Former Toledo Mayor Mike Bell was the first emcee to introduce the performances. “Y’all ready to have some fun?” he asked the audience, to which members replied with cheers and applause. Julie Alley, 2011 visual communications graduate from Bowling Green State University, said that she and her boyfriend, Paul Seeger, were at the festival with hand-crafted bracelets to promote their ministry in the Philippines. “Currently, we have 700 bracelet makers we’re keeping out of human trafficking,” Alley said. Joseph Zielinski was there to represent the Multifaith Counsel of Northwest Ohio, a lay organization of people from a wide variety of diverse religious traditions. “Our goal is to get people from different faith organizations to talk amongst themselves and find out about each other. One of the biggest things that contributes to a significant amount of strife in the world is not knowing the people that we somehow find ourselves in opposition to,” Zielinski said. Beth Anne Varney is a volunteer of the Alzheimer’s Association, who said it was the organization’s first year at the event. “Alzheimer’s and memory related disorders have no nationality bias, so it’s an awareness for everyone in all nationality groups,” Varney said. Crafts and an inflatable bounce house were also available for kids to enjoy. “We’re here to celebrate diversity. We’re here to celebrate world peace, the acquisition of world peace,” Hartung said. To act as bridge to foster international activity for world peace and global concerns in education, culture and business in an atmosphere of understanding and mutual respect.